It's a fact of life that accidents do happen. Tragically, they also happen to (gasp!) wine bottles. Sad, but true. But now, a new company called Accidental Wines is taking all those damaged and discontinued bottles and finding them homes: starting with yours! Three friends in California have made a mission of buying up damaged bottles (nicked or torn labels; labels with wine splashed on them), retired wines (the winery changed the label design), and discontinued ones (the winery went out of business), and offers them to the public at a discount. When you're sipping on a gorgeous vintage at a reasonable price, who cares what the label looks like?! You can browse their Specials section for named vintages, or simply specify '"red" or "white" to take your chances with one of their mystery packs. Accidental Wines is subject to the same shipping restrictions that all interstate shippers of alcohol face, so be sure to check their site for availability to your area. Shout-out to PoppTags for the find! 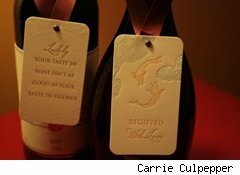 Attach one of their adorable gift tags to dress up even the humblest wine bottle.